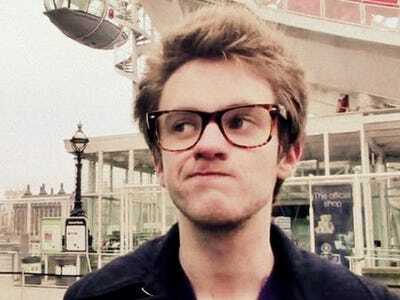 Alex Day might just be the most famous musician you’ve never heard of.Finding loads of success through his YouTube channel, the U.K. native holds the Guinness World Record for the highest-charting single by an unsigned artist for his song “Forever Yours,” which peaked at #2 on the UK Indie charts. Day makes his full-time living as a musician and he does so without touring. He obviously has some unique ideas on what it means to be a musician and how to best participate (or not participate) in today’s music industry. He was kind enough to share some of his thoughts with us below. BUSINESS INSIDER: First off, what can you share about yourself, your background, your music, and the like? ALEX DAY: I’ve been writing music for 10 years, recording/releasing it for nearly five and producing my own songs for a year and a half. I never studied music at school because it always felt very private to me and I felt like I’d ruin it if I did it in front of other people. Where other people do gigs in their local area to build a following, I made YouTube videos to get the word out on my music and myself and I built up a huge audience of over 600,000 people around the world. BI: You literally hold a world record for the highest charting single by an unsigned artist. How did you do this? AD: All from my YouTube audience! I had zero PR, no record label, no management, no radio support. But I’ve been honest with my audience about who I am, I don’t always talk about music because music isn’t my whole life (and isn’t it awful when you chat to someone and all they are is their job?) – so when it came time to share a dream I’ve always had like getting into the UK Top 5, thankfully people supported me and supported the song. BI: Are you doing anything that other musicians couldn’t do? AD: Not at all, in fact I’m actually not doing a lot of things regular musicians do. I don’t play gigs, for example, because the joy I get out of making music is in being in the studio, playing every instrument, stitching it all together and then presenting it online with a music video. That’s how I prefer my music to be heard and shared. I also don’t do regular covers on YouTube. Most of the artists I’ve seen with an online video presence just do covers of the latest pop tracks every week, or upload live stuff, and the only time they stop to talk to their audience is to talk about upcoming tours (which, being the internet, most people won’t be able to go to). I just find it very-samey and bland, nobody stands out, you’re never really excited about watching what they upload next. The things I say to my audience are the same things I’ll tell friends – funny stories, interesting things that have happened recently, just letting people in on your life a bit so people don’t just have the music to go on. BI: Have you been offered contracts before? AD: Yeah, I’ve had meetings with every major label in the UK now but they couldn’t offer me anything I couldn’t do myself, which is a shame – at least not without serious downsides. I’d love to have my songs on radio but not if it means having a VEVO channel to funnel views away from my online home to some random place with an advert of Rihanna next to it. Rihanna’s great but I don’t know why all those VEVO artists agree to have adverts for other acts on their stuff, I’d hate that. I also rather enjoy keeping all the money I make, so it’d take a pretty great deal for me to wanna give that up. Labels have also made it very clear that they want “albums, not singles,” which I think is ridiculous, because I can’t remember the last time I listened to an album as they’re mostly filler. I think there’s definitely a place for albums in the music market but they should never be the front focus unless it’s a concept album or a soundtrack. I’m always thinking only as far as the next single, what I want the video for it to be, how to promote it etc. BI: What would signing with a label offer you that you can’t do by yourself? AD: In theory: they’d be able to get my songs on radio, they could get press people interested so the tracks would permeate the mainstream, my songs and music videos would win awards, I’d reach the rare level of success that straddles commercial popularity with critical acclaim selling millions of my songs and ultimately I could wake up every morning with a smile of pride on my face looking at a shiny metal disc hanging on the wall of a house I’ve paid for outright. BI: Are those advantages enough to make you want to go with a label? AD: No, because none of those things will actually happen. Major labels will often sign artists simply to stop other labels signing them. They start asking for royalties on your music before they’ve even done anything for you. Unless you’re made a priority act you’ll sit around not being able to do anything with them, but you won’t be able to do anything without them either, so it’s likely you’ll be completely stifled (and certainly moreso than if you stayed on your own). Labels think they know better than you what your musical direction should be. They’re seldom interested in covers, because they can’t earn off your publishing rights on songs you didn’t write yourself, so they discourage you from doing that even if you want to. They don’t understand the online world at all – a label guy recently said to me that he thinks I’m good at “the online stuff” but not the “real-world stuff, as if people on the internet exist in their own dimension! – continuing that “there’s no proof those people will walk into a store and buy your record just because they’ve clicked a button on a computer,” which is as outdated as it is insulting to the people that support me. If there’s a label that exists that doesn’t do or think any of those things and offered me a good deal, I’d consider it, but in my experience there isn’t. There are those rare circumstances when – label or not – a song or a video absolutely blows up, but that seems to happen regardless of label input so I figure if we’re waiting for anomalies I’ll take my chances on my own where I can at least have a say in how I go about things without answering to anyone who doesn’t know what they’re doing. BI: How much of your sales are physical media vs. digital downloads? AD: I sell physical stuff online through a mail-order distribution company called DFTBA that takes care of online musicians. Looking at the whole of 2012: physically I sold 791 CDs through the whole year for a total of $10,852. If you include other merch – wristband, posters, t-shirts etc – the number jumps to 6,210 items sold and a total income of $96,707. Digitally, I sold 293,760 digital downloads of songs on iTunes, making me $246,340.95. So clearly the money’s in the iTunes single downloads, but the merch makes a nice extra amount. Bonus fact: my songs were streamed 632,318 times, making me $2,782.11, but that figure doesn’t include YouTube music video views which would bring the total play count to over 10 million and the earnings substantially higher. BI: Is it silly for musicians starting out today to want to produce physical media? AD: Not at all, but I don’t think it should be the driving force. Physical media, digital media; it’s all just distribution. Musicians starting out today should want to produce music – how it gets to people really shouldn’t matter very much. That said, I like creating nice physical products for people and I think they do offer some nice value, particularly for gifting. Louis CK is amazing for releasing his Beacon theatre show on his site for five bucks but I can’t buy a DVD of that show for my aunt when it’s her birthday and it’s a lot less meaningful a gift to slip her five dollars and tell her to download a video. In any case, I think there will be a time where digital distribution is the major method and we won’t need CDs or DVDs, but it’s technology that will drive that change forward, not media creators. BI: What’s the future of the music industry look like? AD: Probably much the same as it looks now. There will be huge corporations funelling mass amounts of money into boring acts and most of them will fail and a few will do really well, but the difference is I think in the future they’ll go ignored because they’re not doing anything new. For people to be excited about music, they HAVE to be looking at the internet, at new unsigned talent, at people making their own rules. I mainly hope more people will be going the route I’ve gone of doing everything myself. The Beatles popularised the idea of playing your own instruments as well as performing, and I’d love the chance to do the same for music production and music video creation. To be able to write a song, record it, perform it, play every instrument on the track, put it all together, design the artwork, submit it to iTunes, plan the music video, film it, edit it, reply to comments when it goes live, send it to DJs in the hope they pick up on it…it means you get to infuse every aspect of how your music is represented with the same uniqueness you bring to the music itself and when it works it’s the most satisfying feeling in the world because you know you’re the one who got you there. Nobody is gonna care about your art as much as you do so you might as well be your own head cheerleader.